We’d love your help. Let us know what’s wrong with this preview of The House That Lou Built by Mae Respicio. Lou Bulosan-Nelson is going to build her dream. She shares a room with her mom in her grandmother's house in San Francisco, and longs for a place of her own where she can escape her lovable but large extended Filipino family. Lou has a talent for woodshop class and creating projects, and plans to build a tiny house, 100 square feet, all her own, on land that she inherited Lou Bulosan-Nelson is going to build her dream. She shares a room with her mom in her grandmother's house in San Francisco, and longs for a place of her own where she can escape her lovable but large extended Filipino family. Lou has a talent for woodshop class and creating projects, and plans to build a tiny house, 100 square feet, all her own, on land that she inherited from her dad, who died before she was born. Then Lou discovers it's not so easy to build one, but she won't give up on her dream—and her friends and family won’t either. This heartwarming coming-of-age story explores culture and family, forgiveness and friendship, and what makes a house a true home. To ask other readers questions about The House That Lou Built, please sign up. Is it smaller font? I need eighth grade reading level!! THANKS IN ADVANCE!!! Perhaps inspired by Erin Entrada Kelly, Mae Respicio drew on her Filipino heritage for The House That Lou Built, and the story's originality is notable. Lucinda (Lou) Bulosan-Nelson, soon to be thirteen, loves her family. Her Filipino mother's relatives are ever-present: hosting parties, cooking good food, always ready to lend a hand. Lou never met her own father, a white man with a passion for building with his hands, but she inherited his knack for construction. After he died in a car accident Perhaps inspired by Erin Entrada Kelly, Mae Respicio drew on her Filipino heritage for The House That Lou Built, and the story's originality is notable. Lucinda (Lou) Bulosan-Nelson, soon to be thirteen, loves her family. Her Filipino mother's relatives are ever-present: hosting parties, cooking good food, always ready to lend a hand. Lou never met her own father, a white man with a passion for building with his hands, but she inherited his knack for construction. After he died in a car accident, Lou's mother persevered; she went through nursing school and is now applying for jobs all over California and beyond in hopes of creating a better life for her and Lou. Why she would consider moving away from their extended family is a mystery to Lou, but it isn't a major worry...until it is. When Lou's mom is offered employment in the state of Washington, the possibility of leaving San Francisco takes on substance. Lou and her mother depend on close connections with their cousins, aunts, and grandmothers; how could they start over in another part of the country and be happy? Lou's thoughts drift to a small tract of land her father bequeathed her, on which he intended to build a house for his wife and daughter. Might Lou fulfill that dream now? She hasn't the materials, knowhow, or manpower to erect a regular house, but could she build a "tiny" house, a recent fad on television? Tiny houses have minimal environmental impact and are simpler and less expensive to construct. As Lou's mother leans toward accepting the job in Washington, Lou wonders if she'd change her mind if Lou were to sneak out to her father's land and begin building a tiny house. Would she reward her daughter's initiative by reconsidering the move? Lou fears her mother will nix the plan if she finds out before Lou gets started, so she enlists the help of several cousins, Mr. Keller—her shop teacher—and Jack Allen, a boy from school interested in filmmaking. Lou isn't ready to pack her bags for Washington just yet. Lou's hunch is right: when her mother gets wind of the project, she forbids her from building on her father's land. Her mother believes the benefits of accepting the high-paying job in Washington outweigh the negatives. Lou continues sneaking out to lay the foundation for her tiny house, but keeping her cousins focused is a chore. Making a house from scratch, even a miniature one, requires countless hours of labor. The shed on her father's land contains most of the raw materials, but many skilled hands are needed to do the work. The devastating blow to Lou's plan comes in a government letter announcing that her land will be publicly auctioned off if a large amount of money in back taxes isn't paid. Leaving California, forfeiting the land her father entrusted to her, saying goodbye to her extended family...will the losses never cease for Lou? But maybe there's hope. The government won't repossess the land for a few weeks, and if Lou raises the money before then, her dream won't die. There's a lot of resiliency in her Filipino-American family, and Lou's friends are just as determined not to lose her. Jack, a popular guy at school whom Lou hardly knew before he agreed to help with her tiny house, might even turn into more than a friend. Can Lou complete her father's mission to put a roof over his family's heads on this very parcel of land...or is his wish for them to find a true home already satisfied? Thanks to the publisher for a free review copy of this book! Lou is a middle grader with a knack for building. She excels at her woodwork classes and has dreams of building her own tiny house. Especially because she currently lives with her mother in her grandmother’s house and barely has any privacy. She becomes even more desperate to build when her mother decides to move Lou away from her friends and large Filipino family for a new job offer. I enjoyed reading LOU and definitely thought her to Thanks to the publisher for a free review copy of this book! I enjoyed reading LOU and definitely thought her to be one unique little girl. She is so determined and such a little leader. Lou also has great friends and family who work hard to support her dreams. Especially by the end of the story, she learns what a home really means and the value of good friends. I loved meeting Lou and learning about her passion of building a very unique home. I love love love the fact that this is about Filipino culture and identity. I loved reading words in Tagalog and nodding my head in agreement about traditions and superstitions. I also find it pretty aqesome that the protagonist is female, mixed, and loves to build things with her hands. She definitely doesn't fit the stereotype of a girl, and it makes her that much better. I received an advanced copy of The House That Lou built, thanks to Random House Kids books. I read it in a day and I absolutely loved it. Lou’s story is strikingly original, as is she. She is resilient, persistent, and real, making mistakes and learning from them. I couldn’t think of a better role model for my students. Lou and her family are beautifully developed, and her creativity and optimism when presented with problems are both traits of like to see developing in my students. But what stru I received an advanced copy of The House That Lou built, thanks to Random House Kids books. I read it in a day and I absolutely loved it. Lou Bulosan-Nelson is not your typical 12-year old. This Filipina- American girl has spirit, intelligence and perseverance. Equipped with power tools, goggles and her blueprints, Lou is determined to build her very own tiny house on the land that her dad left for her. She shares a room with her mom in her grandmother’s house and longs for a place to call her own. With the help of her friends and her teacher, Lou seeks to accomplish her dream. But, one day her mother receives a certified letter a Lou Bulosan-Nelson is not your typical 12-year old. This Filipina- American girl has spirit, intelligence and perseverance. Equipped with power tools, goggles and her blueprints, Lou is determined to build her very own tiny house on the land that her dad left for her. She shares a room with her mom in her grandmother’s house and longs for a place to call her own. With the help of her friends and her teacher, Lou seeks to accomplish her dream. But, one day her mother receives a certified letter and she discovers that her land might not be hers for very long. Can Lou build her 100 square foot dream house and save her land before time runs out? The House That Lou Built is a timely, coming of age story centered around family and the true meaning of home. I loved Lou and her tiny house dreams. The friends and family in her life made me so happy. What a lovely, heartwarming book. Students will write about a main character from the story and whether they would like to be friends with this character or not. explanations should contain at least 3 characteristics or reasons behind their decision that draw specifics from the text. I chose to write about the main Character Lucinda, Lou. I can picture myself being friends with Lou for a variety of reasons. Lou is someone who goes after what she wants even when it is hard, she is a good friend, and she is comfortable in her own skin. To begin, I would like to be friends with Lou because she is extremely determined and goes after what she wants. I think I would enjoy being friends with someone like that be I find myself to be someone who needs an extra push to go for things sometimes, and Lou could be that friend for me. She reminds me of my real life friend Abbey who never lets me make excuses to not follow my passions. Lou shows her grit and desire for what she believes in when she goes to the county tax collector Mr. Rodrigo to plead her case. That is not something most 12 year olds would do. I think it's really cool how she takes things into her own hands to get what she wants. Next, Lou is a good friend. I like the way she has had the same friends for years. That's how my friendships are too. Lou is very dedicated to her friends and it shows in their dedication to her. Even when she becomes frustrated and does not appreciate all they are doing for her and Sheryl gets hurt, Lou tries to make it right. She reflects back on how she has forgotten to say thank you or -her mom's favorite- I appreciate you. The first thing Loud does after Sheryl is hurt is go to apologize. It doesn't make what happened go away, but it shows that Lou is a loyal friend to her cousin. Her friends and family think of her a sister even though Lou has none. I believe that speaks volumes about her as a caring and good friend I would like to have. Finally, Lou is comfortable in her own skin. This is something I appreciate in people I am friends with. Her aunt pushes her to wear a skirt or more girly outfits, but Lou sticks with her converse, t-shirts, and jeans. Something she later finds out her father wore too. Lou also is comfortable with her interests. I think it's cool that she is interested in architecture at such a young age and that she owns wood shop even though she's one of the only girls. She really owns her interest and even knows a lot about other female inventors like she aspires to be. It's nice being friends with someone who knows who they are and is comfortable with that. Especially in middle school! There are many reasons that Lou would make a good friend and that I could picture myself enjoying her company. Lou is a very interesting and confident young lady which makes her intriguing. she is a good friend, and she is willing to go the extra mile to achieve her dreams. Respicio, M. (2019). The house that Lou built. Waterville, ME: Thorndike Press. My first book of 2019 was such a joy to read. Lou is a biracial 12 year-old girl living with Filipino family in San Francisco. She loves to create things and she dreams of building her own tiny house on a spot of land that her late father left her. But when Lou's mom begins considering a job in a different state, Lou kicks her plan into high gear in order to finish building the house in time to convince her mom not to make her move away from her friends and family. This Actual rating: 4.5 stars. This heart-warming middle grade novel was so precious, for so many reasons. I loved the #OwnVoices Filipino rep, and I was honestly grinning and laughing throughout the whole book because of how much Lou's family reminded me of my own Filipino family. Lou being biracial wasn't the focus of the story, but nonetheless, Mae Respicio did a superb job of touching on the displacement and outsider-feelings that biracial kids often experience; Lou's thoughts of not being as brown as her family, people mistaking her mother for her nanny, and reconciling being half-white while she really just felt Filipino all ringed so true for me as a biracial Filipino reader. I would love to see Mae continue to write more books with Filipino families at the center, because the Bulosan family truly stole my heart. This book is very much about community, and that element is explored in a layered approach: the Filipino community in SF, Lou's community with her friends, her extended family, and the adults in her life. Her woodshop teacher, Mr. Keller, and Annie, who runs the salvage shop, were enjoyable characters who represented the value of pre-teens & teens seeking mentorship. It was quite perfect that throughout the novel, Lou and her family are helping to prepare for the Filipino community festival, of which the theme is "bayanihan," which means community coming together. This word truly embodied the heart of the story (and was my Lola's favorite word, which she always said was the word she would pick to describe her life). A young girl, innovative, driven, aspiring to make her dreams a reality. Surrounded by loved ones, close bonds between family and friends never fading. The sight of smiling images adorning the walls, the smell of crispy lumpia rolls, and the sound of laughter and dance filling the air. Her mind filled with thoughts of honoring her father, using her own hands to create a tiny house, a home, on his land. I am me, I am Lucinda Bulosan-Nelson. I have admired the ability of poets to, so eloquently, evoke emotions and precious memories within readers. Throughout my schooling, when presented the option, I strived to construct poems that would do the same. I view the act of creating a poem about a character as a highly beneficial alternative assessment opposed to a book report. In order to construct a poem about a character, one needs to carefully analyze the text, and consider the following possible questions: What were some of the positive and negative experiences the character took part in? What does the character fear? Does the character have a personal goal or a life aspiration they wish to accomplish? What did you learn about the character through their interactions with family and peers? What sets the character apart from the others within the material? The students will have the freedom to “emotionally and intellectually connect with the book,” and present “authentic words and work” to become true independent readers and writers (Miller, 2009, p.12, 16). Again, by supplying students with alternative assessments, educators are motivating children to pursue their own interests and reading beliefs, and ensures a more open, safe, and engaging learning environment. Miller, D. (2009). The book whisperer: Awakening the inner reader in every child. San Francisco, CA: Jossey-Bass A Wiley Imprint. I was thrilled to get my hands on this darling book the day it was released. Lou is a 7th grader who is half-Filipino and half-Caucasian. She lost her father when she was just a baby, but she has an extremely supportive family living in close proximity. Because her mother is struggling financially, she is considering accepting a job in Washington state that would pay for Lou’s future college costs. However, this would take them far from their family and friends. So Lou concocts a plan to keep he I was thrilled to get my hands on this darling book the day it was released. Lou is a 7th grader who is half-Filipino and half-Caucasian. She lost her father when she was just a baby, but she has an extremely supportive family living in close proximity. Because her mother is struggling financially, she is considering accepting a job in Washington state that would pay for Lou’s future college costs. However, this would take them far from their family and friends. So Lou concocts a plan to keep her mom from taking the offer. Her plan involves confronting the local tax office and building a “tiny house” on the property her dad left behind for her. This is an addictive and exciting story right up until the sweet ending! The excerpt I read sounds intriguing. Then I read some reviews of the book on various sites. Still sounds like a good read. I would think 5th to 8th grader might enjoy this story. Some may well be puzzled as so many schools have discontinued shop classes. Liability must be pretty high and do they really have a use anyway. Much like home ec. At least skills in home ec are useful. Not sure about shop classes.... They seem to have been more useful back in the 60s and 70s. By the 80's and 90s not mu The excerpt I read sounds intriguing. Then I read some reviews of the book on various sites. Still sounds like a good read. I would think 5th to 8th grader might enjoy this story. Some may well be puzzled as so many schools have discontinued shop classes. Liability must be pretty high and do they really have a use anyway. Much like home ec. At least skills in home ec are useful. Not sure about shop classes.... They seem to have been more useful back in the 60s and 70s. By the 80's and 90s not much was being done in them. Now most are gone. Anyway, trip down memory lane. The middle schoolers, particularly girls, may be interested in a girl setting out to build her own tiny home. If you love books featuring strong female characters and are curious about the tiny house movement, The House That Lou Built needs to be your next read! The main character, Lou (short for Lucinda), is a strong-willed, independent middle schooler with a large and immensely supportive Filipino-American family. Lou’s passion is building things and she loves learning about all different types of houses, tiny houses in particular. Lou’s father died before she was born, but he and his family left Lou a piece of land outside of San Francisco. When Lou’s hard-working mother finishes nursing school and contemplates moving out of state for a new job, Lou cooks up a plan that she is sure will convince her mom to stay. Why not build her very own tiny house on her land, just like her father planned to do for them before he died? Lou enlists the help of her friends and family, but nothing ever goes quite according to plan in life, does it? When Lou can’t finish her project on her own, who will she turn to? Will it be enough to convince her mom to stay close to their friends and family? Find the answers to these questions and more by reading The House That Lou Built. Join Lou on her adventure of friendship, family, and first crushes, but most of all, her quest to never give up hope. Miller, D. (2009). The Book Whisperer. San Francisco, CA: Jossey-Bass. This is a story with a lot of heart set in a strong, caring Filipino-American community in San Francisco. So sweet, so wholesome, and I think the first book I've read with a Filipino-American family. A read that will make your heart happy. Middle school teachers, add this to your library! Thanks to the @kidlitexchange network for a review copy of this book. All opinions are my own. There is so much to celebrate in THE HOUSE THAT LOU BUILT. I know that my girl-power-loving second grader will love reading a book about a strong, smart, independent young girl who can bridge between goofing off with friends and managing a complex construction site. I'll also recommend this book to my half-Filipina nieces, who I’m sure will appreciate reading about Lou, her Filipino culture, and her lo Thanks to the @kidlitexchange network for a review copy of this book. All opinions are my own. There is so much to celebrate in THE HOUSE THAT LOU BUILT. I know that my girl-power-loving second grader will love reading a book about a strong, smart, independent young girl who can bridge between goofing off with friends and managing a complex construction site. I'll also recommend this book to my half-Filipina nieces, who I’m sure will appreciate reading about Lou, her Filipino culture, and her loving extended family. I learned new Filipino vocabulary and customs, and saw references to some familiar elements like the lumpia we sometimes share at family gatherings. What a fun and beautiful story. I loved Lou's spunkiness and determination to built her tiny house. I went and looked at tiny houses afterward; they are SO cute! The characters felt true to life with their unique talents and strengths. I loved that all the elements of family and friends and home came together by the end. I especially loved the touching scene near the end of her dad. It made me cry. Such a fun MG with a spirited protagonist. Lou wants nothing more than to build a tiny house on land left to her by the father who died before she was born, but when she learns that she and her mom may need to move out of state, she faces the reality that she might have to leave that dream behind--along with her loving extended family. I loved watching Lou fight for what she wanted. A fun read that also made me very hungry! Thank you to the publisher for this ARC. The House That Lou Built was a sweet story about a 7th grade girl named Lou who dreams of building a tiny house on land her father left her. Lou is Filipina, and the author did a great job incorporating the culture into the story. Reading about different food and festivals was a highlight of this book. I also loved the relationships between Lou and her friends. They supported her in her dreams but still kept Lou grounded when she let her dream change the Thank you to the publisher for this ARC. The House That Lou Built was a sweet story about a 7th grade girl named Lou who dreams of building a tiny house on land her father left her. Lou is Filipina, and the author did a great job incorporating the culture into the story. Reading about different food and festivals was a highlight of this book. I also loved the relationships between Lou and her friends. They supported her in her dreams but still kept Lou grounded when she let her dream change the way she treated them. It was wonderful to read about middle-school girls being supportive, cheering each other on, and not being catty or fighting over boys. This book made me cry before I'd even finished the first chapter. Lou exists in a very different context than I did as a young girl, but so many of the little touchstones in her life--Filipino food, family friends, working out her identity as a biracial Filipina-American girl--are familiar to me. Her stubbornness and spirit made me wonder if I was ever that strong as a kid, and her struggle with the idea of moving is a struggle my heart knows all too well. Mae Respicio writes Lou with a voice th This book made me cry before I'd even finished the first chapter. Lou exists in a very different context than I did as a young girl, but so many of the little touchstones in her life--Filipino food, family friends, working out her identity as a biracial Filipina-American girl--are familiar to me. Her stubbornness and spirit made me wonder if I was ever that strong as a kid, and her struggle with the idea of moving is a struggle my heart knows all too well. Mae Respicio writes Lou with a voice that rings true and real, her worries and dreams grounding her through this story. This book was so utterly delightful. From the first page, I was captivated by Lou's voice; I loved her big, wonderful family, her plucky DIY spirit, and (of course) her tiny house dreams. 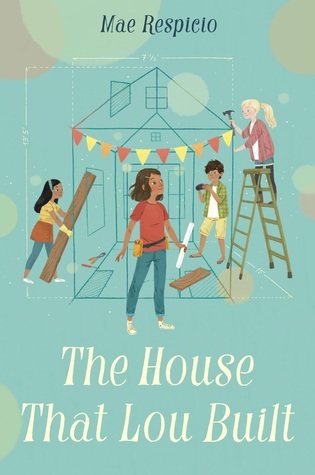 From the moment I first saw the deal announcement for a middle grade book about tiny house building, I've had my eye out for Mae Respicio's THE HOUSE THAT LOU BUILT, and it didn't disappoint! By turns hilarious, heartwarming, and inspiring, this is definitely a debut to watch for.